Moon Duo are comprised of Ripley Johnson (Guitar) and Sanae Yamada (Keyboards) and come from Portland, Oregon. 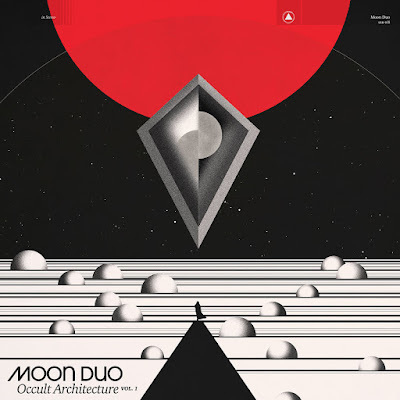 The band's previous three albums have clearly shown them to be fine purveyors of the psychedelic rock scene, and their latest offering, the two volume 'Occult Architecture' pushes yet more boundaries into the trippy unknowns. According to those in the know, Occult Architecture is an intricately woven hymn to the invisible structures found in the cycle of seasons and the journey of day into night, dark into light through the Chinese theory of Yin and Yang. Intriguing stuff! Volume 1 of this two parter is the Yin then, which in Chinese means the 'shady side of the hill', and is suitably appropriate for this half of the record, which displays the darker, moodier, and broader aspects of the band, displayed through tracks such as 'The Death Set', 'Cult Of Moloch', and 'Will Of The Devil'. The album, which is released through Sacred Bones Records, was recorded at the Type Foundry in Portland, whilst it was mixed by long time collaborator Jonas Verwijnen in Berlin. There's only 7 tracks but the record still clocks in at the 47 minute mark, with each song allowed time to develop and build steadily towards a usually dynamic ending. Occult Architecture Vol 1. is a compelling and alluring listen, with the 2nd volume to come a tantalising prospect.